Fred Morse of Abengoa sets the tone for a big Q4 in CSP. Don’t let anyone tell you the Obama administration’s stimulus program is not effective. Solar Power International has taken over downtown Los Angeles. Guestimates are that 27,000 people will descend on the Los Angeles Convention Center to view the 1,100 solar exhibitors. Half of the passengers on my flight from San Francisco to LAX were solar industry folk. To paraphrase Vice President Joe Biden -- it's a big flipping deal. Solar has arrived. The first person I spoke with this morning was Fred Morse, Abengoa's Senior Advisor for US operations and the man that Forbes Magazine dubbed the "King of the Solar Thermal Industry." He gave a very quick update on Abengoa's oulook for U.S. CSP in the fourth quarter and a really positive feel for the jobs potential of big CSP. Fred Morse sent a very positive message on U.S. CSP projects finally breaking ground, providing significant amounts of electricity and creating American jobs and manufacturing. Morse spoke of 4,000 megawatts of CSP in California, a significant fraction of California's energy usage. Abengoa's Solana Generating Station is a 250 megawatt trough system with molten salt thermal backup to essentially create spinning thermal reserve. Construction starts this quarter as does the BrightSource Energy Ivanpah project. Morse said the drivers for the construction were the expiration of the tax grant and the BLM fast tracking program. Don't let anyone tell you the Obama administration's stimulus is not effective. BrightSource Energy's $1.37 billion loan guarantee will yield jobs and U.S. manufacturing jobs. 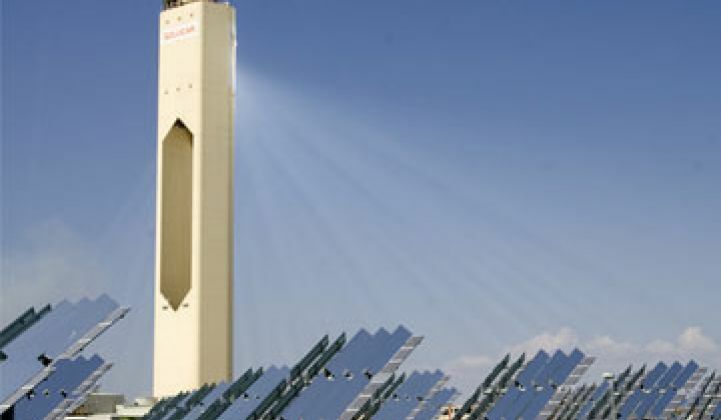 As will the Abengoa projects. Morse said that the Solana project will use enough steel to build an entire Golden Gate Bridge. Abengoa is building a factory in Arizona to manufacture the mirrors. That's more employment. Over the three year construction period, the Solana project will employ about 1,600 people and 85 people will be needed to operate the plant once it is in operation. These people will be deliberately recruited from the local communities, many of which sorely need the jobs. It's carbon-free electricity from the sun creating U.S. jobs and manufacturing. Lots more from SPI in Los Angeles to come.